A Russian Proton rocket launched Sunday with a European broadband communications satellite, the continent's first spacecraft dedicated to high-throughput Ka-band connectivity for Internet and television services. The satellite, named KA-SAT, carries 82 Ka-band spot beams to spread a staggering 70 gigabits per second of capacity across Europe, North Africa and the Middle East. Eutelsat, the satellite's Paris-based operator, says KA-SAT will usher in new consumer and professional broadband markets and expand existing digital services. The 13,558-pound satellite launched at 2151 GMT (4:51 p.m. EST) Sunday from the Baikonur Cosmodrome in Kazakhstan. The 191-foot-tall Proton rocket lifted KA-SAT and a Breeze M upper stage into space in less than 10 minutes, then the Breeze M took over with the first of five planned engine firings. The first upper stage maneuver was necessary to place itself in a stable low-altitude parking orbit. Four more Breeze M burns raised its altitude and reduced its orbital inclination. Deployment of the KA-SAT payload occurred at 0703 GMT (2:03 a.m. EST) Monday. The Breeze M burns will raise its altitude and reduce its orbital inclination. Deployment of the KA-SAT payload is scheduled for 0703 GMT (2:03 a.m. EST) Monday. The targeted separation orbit had a high point of 22,236 miles, a low point of 2,307 miles, and an inclination of 24.6 degrees. KA-SAT will use an on-board propulsion system for the rest of the journey to geosynchronous orbit, eventually reaching a circular orbit 22,300 miles above the equator. KA-SAT will be stationed at 9 degrees east longitude. "We expect to bring the satellite into commercial service in May after the tests and validation of the spacecraft with the on-ground network," said Vanessa O'Connor, a Eutelsat spokesperson. KA-SAT is Europe's first satellite with an exclusively Ka-band communications payload. According to Astrium, the spacecraft manufacturer, KA-SAT will be the world's most powerful satellite. The craft's capacity of 70 gigabits per second is 35 times more throughput than available on a traditional Ku-band satellite and five times greater than any current space-based communications platform. 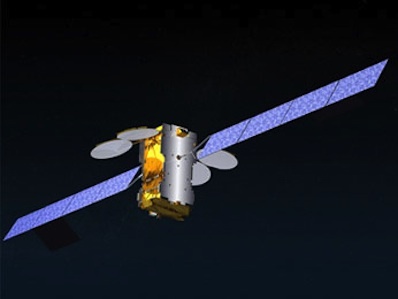 "For KA-SAT, we have optimised both spatial and spectral resources in order to deliver to Eutelsat a satellite with exceptional throughput - five times greater than that of any other current satellite," said Aziz Bouhia, Astrium's KA-SAT project manager. "We have adapted our Eurostar E3000 platform to the specific mission requirements for impeccable coverage targeting." The expected operational life of KA-SAT is 15 years. The new satellite will expand Eutelsat's Tooway consumer broadband service, an initiative aimed at customers in Europe and the Mediterranean Basin beyond terrestrial networks. KA-SAT will serve more than one million users with bandwidth and prices comparable to traditional ground Internet networks, according to Eutelsat. Each of KA-SAT's 82 spot beams can handle up to 900 megabits per second of two-way communications traffic. In addition to Internet and point-to-point communications, the beams will be tailored to deliver local and regional television channels. High-definition programming and 3D cinema will also be routed through KA-SAT. A key advantage of Ka-band satellite communications is open bandwidth. Other parts of the communications spectrum, including Ku-band and C-band, are widely used. KA-SAT's orbital location at 9 degrees east puts it near Eutelsat's Hot Bird satellites, facilitating easier combinations of Ka-band broadband and Ku-band television services with dual-feed antennas. 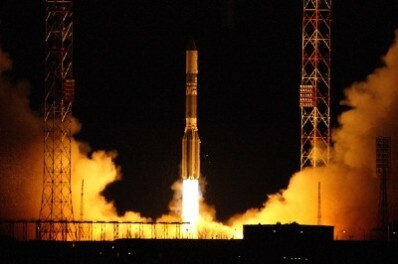 Sunday's launch was delayed one week as Russian officials reviewed the cause of a failed Proton mission Dec. 5. The investigation concluded engineers loaded too much propellant in the Proton's Block DM upper stage. The Proton's three core stages could not lift the extra mass to the proper trajectory, and the rocket and three Glonass navigation satellites crashed into the Pacific Ocean. Commercial Proton launches managed by ILS use a different upper stage, and officials were comfortable to proceed with Sunday's mission. Proton rockets accomplished 12 flights in 2010, and all but one were successful. The Proton completed eight commercial launches this year, all successful.